You were no doubt surprised to receive my cable of today accompanied by $529.0O. This little offering to the boys in your Command was the outgrowth of a splendid idea on the part of one, Marvin Turner, who conducts a restaurant adjacent to the local Fairchild Aircraft Plant and who is discontinuing business on March 31st. He volunteered to contribute his gross receipts from two days business to the boys overseas. A welded steel bucket was substituted for his cash register and every penny taken in was put in the bucket, plus generous contributions from the Fairchild Employees and some assistance from my Board of Directors. Colonel C. W. O'Conner, Air Corps, was put in charge and the bucket was opened at an Executive meeting of the Board today. We all wished you could have been here as it was really a good session, and we are looking forward to the meeting in the not too far distant future when you can sit in and assert your rights as Chairman of the Board. The funds transferred have no strings attached to them, but are to be used by you in any manner you see fit for the pleasure of the boys. Everyone here is in excellent spirits and we are confident the same is true over there. 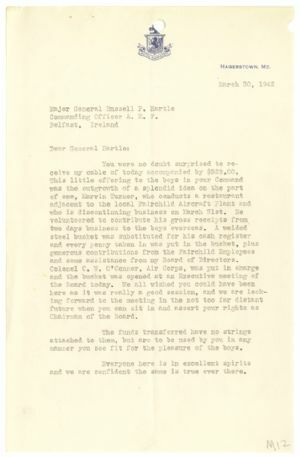 May I suggest that a letter of acknowledgment, addressed to Marvin Turner and the Employees of the Fairchild Company, which could he posted on the bulletin boards of the plant and which would have an excellent reception and effect on the morale of the workers he sent. They are the ones who really put this over, and the Board is merely acting for them. The letter head was the Hotel Hamilton on West Washington Street, Hagerstown.